Written Inc.: Who wants to be carded? It's not often that I get new business cards, so I thought I'd share them here just in case I don't have a chance to give y'all one in person. In our digital age, it's kind of funny that we still need actual paper-based business cards. And given what I do, I should probably be the last person on the planet to carry them. But here's the thing: I like having them in my pocket. I like swapping them with real people when I meet them in‎-person. I like how they add a certain sense of gravity, warmth and connectedness to a conversation. I was like a kid in the candy store the day they came back from the printer last week, and that feeling remains just as strong today. Yes, I'm a strange individual. I know that technology has had an answer to the business card for decades now. I've been beaming contact information back and forth since my Palm Pilot days, and by now it's no big deal to email a PDF of one of these things whenever I meet someone new. But it's just not the same. With great apologies to the geeks among us, I believe that this is one of those cases where bits simply can't hold a candle to paper. And despite technology's hold on my very soul, I have no intention of giving these up anytime soon. I totally agree and have thought a lot recently about that - why do we still use them? But we do. They add credibility to an introduction; a sense of professionalism, maybe. 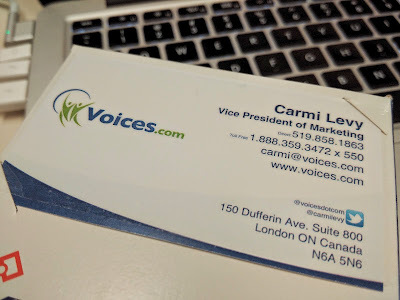 (As opposed to the possible awkwardness of, "here, let me give you my phone number....") Business cards don't disappear instantly into a database of contacts - they float back out of a pocket or wallet sometime, reminding someone of your existence. And you can scribble a note on the back of them - personal.